At Southern Equipment Sales we can provide you with the latest in new vending machines and vending equipment From top the top manufactures including AMS Vendors and Royal Vendors. If you are in the need for a new drink vending machine, a new snack vending machine, or a new combo vending machine, we can help you make the proper selection when choosing new vending equipment for your account. Along with the manufacture's parts warranty on all new equipment, Southern Equipment Sales provides lifetime phone tech support with all vending equipment purchased from us. At Southern Equipment Sales we carry all major brands of new cold drink vending machines to meet your needs. We sell new can and bottle drink machines from Dixie Narco, Royal Vendors, and Vendo. We also sell the all new glass front drink vending machine from AMS. For the 2016 model year we are recommending the Royal cold drink vending machine as our first choice based on its ease of use for first time vendors. We carry all three manufacturers, but will be recommending the Royal as our first choice for the 2016 model year. We are proud to carry the Automated Merchandising Systems (AMS) line of snack vending machines. The AMS line of new snack vending machines provide exceptional quality tied with innovation. All new AMS vending machines feature the Sensit 3 Guaranteed Delivery System. This ensures that your customers are guaranteed a product from your new vending machine or they will receive their money back. Southern Equipment Sales carries the AMS line of new Visi Combo Vending Machines. 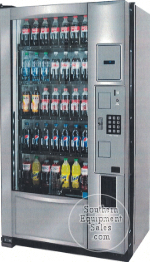 A combination snack and cold drink vending machine which utilizes the AMS SENSIT3 “Guaranteed Delivery System”. The Visi-Combo is equipped with five trays. Three of the trays are for popular snacks and candies. The remaining two trays can vend 12oz Cans, 16 to 24oz Bottels, and other large packages. Using a ½ plus HP refrigeration system, triple pane glass and polyurethane foam insulation, the entire cabinet is kept cold. In 1997 AMS concept of "No Unhappy Costumers", became a reality with the design of their SENSIT® "Guaranteed Delivery System" that all other major manufactures have since started using. Located in the delivery bin are a series of optical sensors. If for what ever reason, your customer's selected product does not drop and trip the optical sensors your costumer will still have established credit and be given the option to make another selection or receive a full refund. The days of loosing money to a vending machine are a thing of the past with the AMS SENSIT ® System. Sandwich Tray - Have a 4" diameter helix available with 5 - 15 pitch Depths. Bottle Tray - Have a 6 pitch helix with an approximate 3 1/4" opening. Will vend Red Bull, 12oz Cans, Milk Jugs, 20 & 24oz Bottles, Large Subs, Burritos, Super Dogs, Etc. A very versatile tray. With the ever increasing price for the cost of cigarettes, older cigarette machines do not have the capability for today's selling price, and higher bill acceptance amounts. We offer a solution to this problem with introduction of the AMS CM series of cigarette vending machines. With pricing setting options from $0.00 to $100.00, both the AMS CM36 and CM60 are able to contend with today's and tomorrow's cigarette selling prices. Both cigarette machines are equipped with a new Conlux dollar bill acceptor that can accept $1, $5, $10, & $20 dollar denominations. The AMS CM36 and CM60 cigarette vending machines are debit and credit card equipable. The AMS CM series cigarette machines can also be configured to sell e-juice and vape juice along with other vaping accesories. Please call for more detials. American Changer is the #1 selling bill changer in the vending industry. They range in price and features, from $999 to $7000. We have listed the two most popular.